Manchester United qualified for the European Cup quarter-finals, becoming only the second side to recover from a 2-0 first leg deficit. David Moyes surprisingly brought Ryan Giggs into the centre of his midfield, used more direct options on the flanks than in the weekend defeat to Liverpool (Juan Mata was cup-tied) and Rio Ferdinand started alongside Phil Jones. Michel was without Michael Olaitan – who is thankfully OK after collapsing in a recent league game – upfront and therefore played Joel Campbell as the lone striker and used Diego Fuster on the right. Otherwise the side was unchanged from the first leg. The match itself wasn’t particularly interesting – tension came from the fact Manchester United had lost the first leg 2-0, and a late ‘consolation’ goal (on the night) would have sent Olympiakos through on away goals. But on the night, the reality is that Manchester United were comfortably the better side in a standard 3-0 win. The major point of interest was the fact the opening two goals came in exactly the same situation, and it’s worth outlining why. The first came from a Giggs diagonal ball into the path of Robin van Persie, who was bundled over by Jose Holebas for a penalty the Dutchman converted himself. The second came from a Giggs pass to Rooney in a similar inside-right position – he then squared for Van Persie, who finished. This pattern had the same cause, and was a result of Olympiakos’ overall approach. Like in the first game, they decided to play a high defensive line and press Manchester United, rather than sit deep close to their own goal. 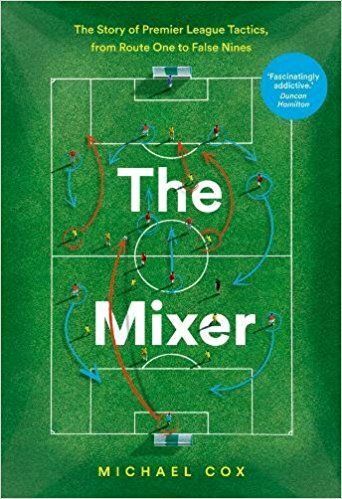 The midfield, for example, was aligned perfectly to ‘match’ United’s trio – Chori Dominguez on Michael Carrick, Giannis Maniatis on Ryan Giggs, and Delvin N’Dinga on Wayne Rooney. Olympiakos attempted to replicate this press in the full-back positions, too. Right-back Leandro Salino was against Danny Welbeck, which was a tricky task because Welbeck continually moved towards play to offer a short passing option, but then spun in behind quickly, providing a threat in behind the defence. The greater problem, however, was Holebas against Antonio Valencia. Holebas is a very aggressive left-back that is much better attacking than defending, which creates problems with his crossing but causes problems behind. There was an obvious example after just four minutes – he whipped in a superb near post cross that Maniatis was inches away from converting. United broke quickly, however, and both Olympiakos centre-backs were dragged into the left-back zone, so Van Persie was left in a colossal amount of space in the centre – but Valencia didn’t spot him. The Old Trafford crowd did, and audibly moaned that the pass wasn’t forthcoming. Holebas’ usual defensive approach is to stick very tight to opponents, often being dragged out of position easily. With Olympiakos’ pressing instructions, that’s exactly what happened here. With Valencia hugging the touchline, Holebas was always located much wider than Salino on the opposite flank, and United could find space between Holebas and Ivan Marcano. This was obvious at various points, but the nature of the penalty decision summed it up nicely. 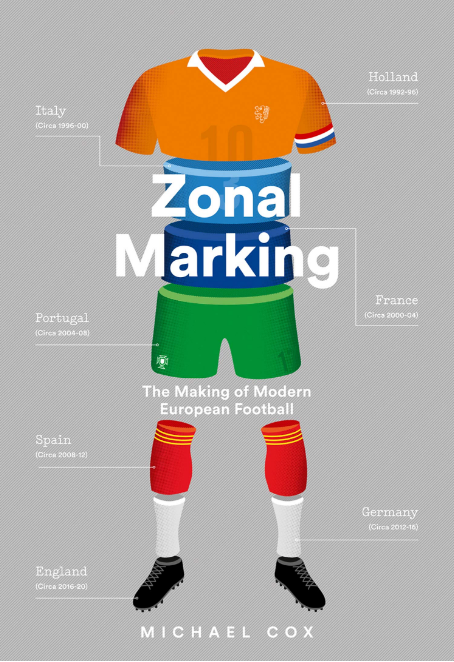 It was helpful, of course, to have a left-footed central midfielder like Giggs in the side – someone capable of hitting long diagonal passes into that zone. Van Persie pulled right into space on the outside of Marcano, received the pass from Giggs, and Holebas desperately darted back into position – and in a poor attempt to stop Van Persie, barged him in the back. The second goal is an even better example. This time, Holebas is concerned by Rooney’s inside-right position and points towards Marcano to pick him up – but Marcano actually moves slightly towards Welbeck, who has drifted inside into a central position. This allows space for Rooney to move into in the outside – he receives a Giggs pass, then crosses for a simple finish from Van Persie, who manages to evade the attentions of both Kostas Manolas and Salino on the right of the defence – they both simply switch off. 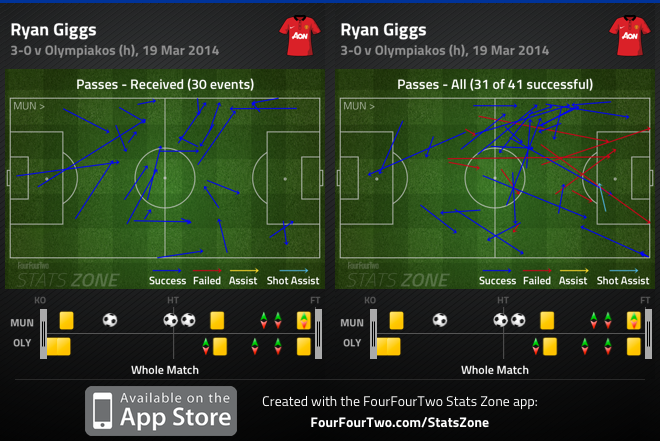 United played quite a few long passes into a right-wing position, compared to none towards the left. They also created most of their chances from the right. ZM usually looks at the tactical battle as a whole rather than looking at defensive mistakes for goals, but it’s rare for a game to be shaped by two such similar incidents. Olympiakos weren’t that much inferior to United across the pitch, they simply made errors because of the positional tendencies of their left-back, and their insistence on pressing in midfield and on the flanks, which exposed their centre-backs go good movement into the channels. Olympiakos’ high line was a mystery, and surely the cause of their downfall. Although it was a bit of a miracle that none of their shots went in. 3-0 win is very convincing on paper but it was clearly because of all the defensive mistakes forced by Olympiakos’ tactical approach to the match. I didn’t see the game, so I am looking at this from a purely hypothetical viewpoint, but a high line against United isn’t that bad an idea on paper. They don’t have the fastest strikeforce, especially with Rooney dropping so deep, so the further you can keep VP from the penalty box the less damage he can do. Welbeck and Valencia are very fast. Neither of which are great goalscorers, and can be pushed further up the pitch with high pressing from the fullbacks (who, in general, are faster than centrebacks but I admit I don’t have a clue about Olympiakos’ defence). I’m not saying it is a foolproof plan by all means, and like everything it is a balancing act. But I am just saying that it isn’t a mystery and there are justifications for doing it. Most teams are probably happier having Valencia/Wellback trying to run in behind on the wings than to let VP have the ball into feet within the penalty area. From reading this analysis, it doesn’t seem like the high line as a whole was a bad idea, but the single, even higher line that the left back took to press Valencia, leaving a gap in behind. …the high line allowed players like Giggs to shine; yes, he’s old, but he has the eye for his team mates and – as ZM already pointed out – was the outlet for the goals. Olymiakos mistake was not to put more pressure on him when playing the high line, maybe they underestimated him because of his age. 7 teams hoping the draw manU tomorrow, by far the easiest opponent in the champions league. This review looks like an unfinished one with a moderately abrupt ending. Noted that most of the important tactical patterns were covered, I thought this review could have done better covering other minor battles such as Evra’s poor defensive qualities leading to Olympiakos fashioning more chances from that side than the other (point supported by Campbell’s tendency to drift out to his right). You are spot on. Olympiacos created most of their chances from that side. If I recall correctly, Joel Campbell and Fuster used their pace and Evra’s lack of defensive discipline to easily bypass him. I remember the commentator was saying that Welbeck was tired and needed to be taken off to help support Evra defensively. Evra will be suspended for the first leg of the quarter finals. Maybe this is a blessing in disguise for United. The only problem is United don’t have a replacement at left back. 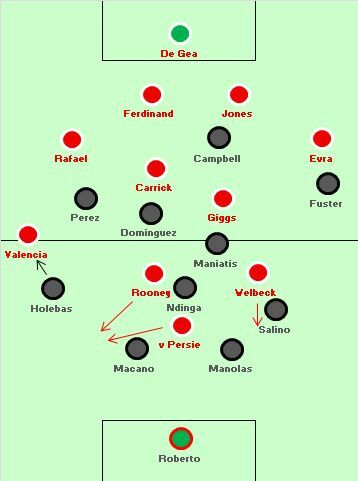 1.As ZM’s graphic showed, United shape resembled an asymmetrical 4-2-3-1 at times. Welbeck often vacated his position on the left to join RVP in the centre to become another de-facto finisher, adding further penetration. This can be seen in the example of the 2nd goal when Welbeck is in the central position with RVP. I believe Moyes chose Welbeck on the left rather than Januzaj/Kagawa as he is more effective in their attacking transitions and adds another penetrative angle. Sunday’s match could have influenced this as United’s attacking transitions were poor that day. 2. With this area offering less protection now due to Welbeck’s positioning, it would be up to Giggs as the left-sided CM to cover these zones. Of course Giggs is 40 and now lacks the pace he once had. He would have to now rely on his defensive awareness and reading of the game to ensure United’s defence transition was strong on this left flank. Although not significant due to the small number, this graphic shows his 2 failed tackles on the left flanks – http://www.fourfourtwo.com/statszone/5-2013/matches/738768/player-stats/3/3_DEFENCE_01#tabs-wrapper-anchor . It would, perhaps, be more interesting if we could look at the match context of these tackles and see what the phase of the play was when they happened. also jesus christ ryan giggs is amazing even in his old age! …..’also jesus christ ryan giggs is amazing even in his old age!’… he didn’t had to run to far in this game, Olympiakos didn’t dispose his possible weakness and they didn’t put enough pressure on him to prevent his passes… nevertheless, playing Champions League at his level being so old: respect!!! the trouble with your writing mate is this you write as to what has happened but not why it had happened . what is utd trying to achieve when they move the ball why do they defend deep or why do olympiacos try to hold a high line . why are utd moving the ball through the wings on offense rather than through the middle and what should they really do open opposition up . if want an example as to what they should do then watch the game on 36th to 41st min. as to what utd should do open defense up or how should they move or who should move in which zone . game is more analytical when you try to explore the possible combinations with the given resources available and their limitations . i had seen your post for the past 2 to 3 yrs but havent seen any improvement in your post . there are many a thing that you have missed in this post and the guys have highlighted that but most of why is utd moving the ball through the wings . The guy writes an awful lot more than just what you see here. If you are so consumed by the problems of his writing and analysis then I suggest you start your own blog. I’m surprised Michel’s unresponsiveness to Evra’s yellow wasn’t noted. While the leftback was under pressure for most of the night, it felt as if Michel should have reacted a bit more with an overload on United’s left. With Ndinga marshaling efficiently in front of Rooney and Giggs (hence the direct passing from United, disregarding the centre of the pitch enitrely), Perez and Salino found much attacking joy on the Frenchman’s side, and though their final balls lacked, he could’ve afforded Dominguez a bit more license to enter United’s left bank to help overwhelm. I could be wrong, but I felt that switch would’ve garnered just a few of more chances, and may have just found Olympiacos their coveted away goal. It is useless to write anything about tactics. This was no tactical victory, Olympiakos had everything needed to win except better players. They had more CCC than United, but their strikers failed. That happens if you play against big teams so the quality gap betweeni team is so big.